Scott Ian, famous for cofounding legendary thrash metal band Anthrax and only slightly less so for his iconic beard, has done and seen a lot in his decades of touring. Those of you who have read Scott's memoir I'm the Man may know the history of the band, but Access All Areas divulges all the zany, bizarre, funny, and captivating tales of what went on when the band wasn't busy crafting chart-topping albums. 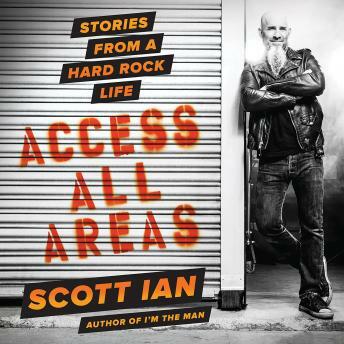 In his more than thirty years immersed in the hard rock scene, Scott has witnessed haunting acts of depravity backstage, punched a legendary musician, been a bouncer at an exclusive night club, guest-starred with Anthrax on Married with Children, invaded a fellow rock star's home, played poker professionally, gone on a non-date with a certain material girl, appeared on The Walking Dead, and much more. Access All Areas allows its readers to do just that. With humor, candor, hindsight, and writing chops that would make Stephen King jealous (nope, not even on Bizarro world), Scott Ian takes his fans along for the ride at all the parties, hot spots, and behind-the-scenes shenanigans they will never hear about from anyone else. And none of it would have happened without a bit of divine inspiration from KISS. (No, seriously. Read chapter two.) Best of all, Scott seemingly lacks the ability to be embarrassed, making Access All Areas howlingly funny, self-deprecating, and every bit as brash and brazen as one would expect from one of the original architects of speed metal.